While Election season is consuming much of our attention, important decisions are being made at home. We have a chance to be involved in an important Land Use process in the next two months. The Bureau of Land Management has released the Draft Resource Management Plan/EIS for the San Juan Islands National Monument. The public is invited to submit comments on the plan. Below you will find a recent newsletter, with links to a website with information about SJINM, as well as a link to the plan, and to comment forms. Marcia deChadenedes, Monument Manager, will be available at the times and locations below to answer questions throughout the comment period. She will have copies of the Draft RMP/EIS, the Instruction Manual, Planning Primer and Guidebook, and comment forms. BLM Releases Draft Plan for San Juan Islands National Monument! 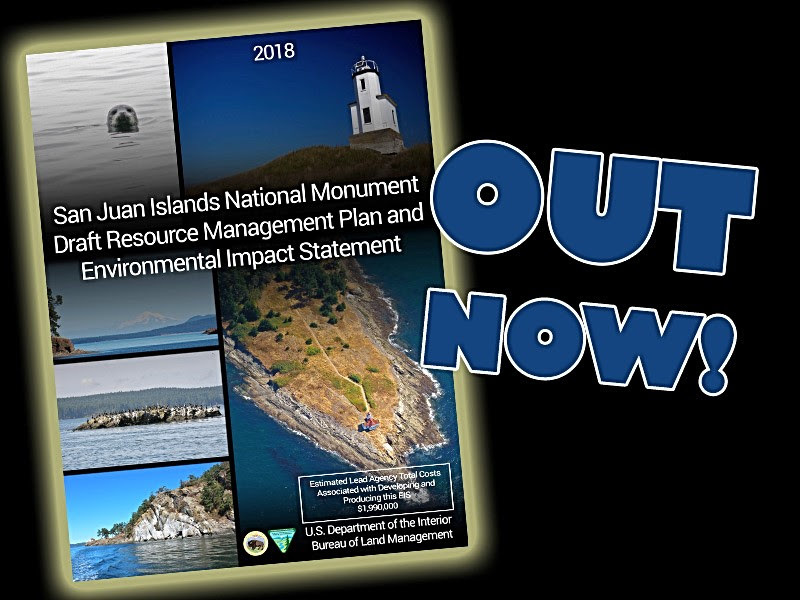 Today the Bureau of Land Management announced the release of the Draft Resource Management Plan (RMP)/Environmental Impact Statement (EIS) for the San Juan Islands National Monument (Monument). The Draft RMP/EIS presents a full spectrum of different management alternatives, and analyzes the environmental effects of the alternatives. Based on this analysis and comments the agency receives on the Draft RMP/EIS, the BLM will prepare a Proposed RMP/Final EIS with the assistance of cooperating agencies. Following publication of this Draft RMP/EIS, members of the public will have 90 days to provide written comments. The BLM encourages all interested members of the public to submit comments and participate in the upcoming open houses and workshops (schedules are below).